This is a quick and easy (and Gluten Free) recipe for something different for lunch or a weekend breakfast, it takes 15-25 minutes to cook depending on the size of the egg so is ideal for mornings where you have little more time. Avocados are easy to find nowadays here in the UK and eating them for breakfast is a great way of getting a massive dose of Omega 3’s at the start of the day. Make sure you use a ripe one for this recipe as it will be much easier to carve out the hole for the egg. As well as being full of healthy fatty acids and proteins they are also low in sugar and high in fibre. You may be wary of eating avocado that’s has been cooked but don’t worry. It doesn’t become at all mushy after being baked and although the taste changes slightly if anything it become slightly more bland, the creaminess of the avocado is great with the egg and there are tons of ways you can easily alter the dish to make it more to your liking. Traditional breakfast meats like Bacon or Turkey Ham work really well served on the side or chopped up and sprinkled over the top of the egg. Other toppings that work well if you don’t fancy the Cayenne pepper suggested in the recipe are some red salsa or a dash of hot sauce. Feta cheese with chopped spring onions is also good. The recipe couldn’t really be any more straight forward, the only slightly tricky parts are making the hole in the avocado where you are going to put the egg big enough, I find the easiest way of doing this is gently circling the hole with a teaspoon removing a little avocado each time. To get the Avocado to stay securely stood up while its in the oven, loosely scrunch up some tin foil and then make a dip in the middle by pressing it down with your thumbs. Halve each avocado and remove the stone. Scoop out a bit of the avocado from the inside, to make room for all of the egg, and reserve it. Take some tinfoil and scrunch it up to make a bowl/stand for the avocado. Crack the egg into each carved out space in the avocado. Top with some cayenne pepper (if you like it) and a little salt and pepper. 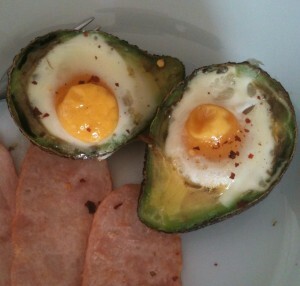 Put the slivers of Avocado that you removed when making the hole for the egg over the top. Article posted in Breakfast, Recipes on October 13, 2013 by Ray Smith.